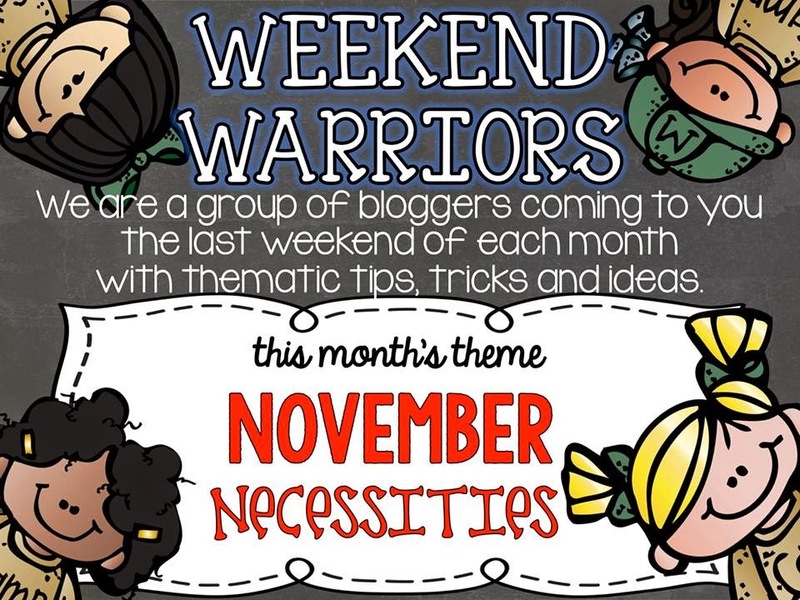 Weekend Warriors is here again - and this time with some of our classroom necessities. I'm going to keep it simple today and stick with 3 of my absolute must-haves. I am positive that I am not the only one who finds teaching without them nearly impossible. So let's get right to it! Oh, Post-Its...how I love you so! I love the colors. I love the different sizes. Post-its and I go way back! In the picture above you can see some of the ways I use them in my classroom. I use them during guided reading with the students to go along with various lessons: finding sight words, monitoring comprehension, etc. I use them to keep track of my student's reading levels in a file folder. This is so easy to just open up and see my whole class at a glance. 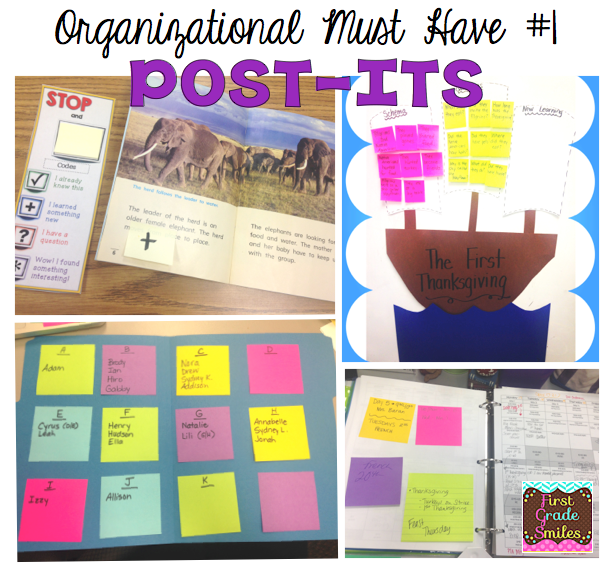 I use them for anchor charts and I also use them in my planbook to remind me of meetings, assemblies, things to do, etc. 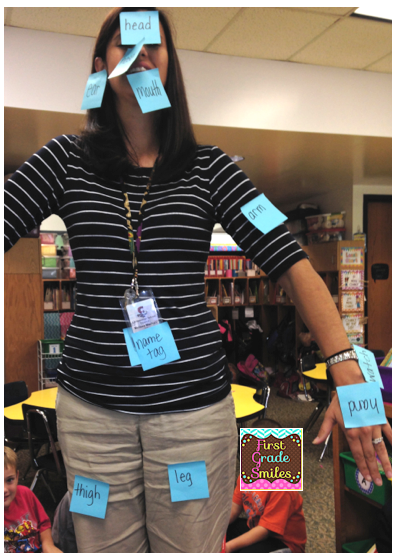 I even use post-its on myself :) Actually, the kids used them to label me when we were learning about labels in nonfiction texts. I am not the only who loves post-its. This beautiful wall was at the Teachers Pay Teachers office in NYC with notes from the Las Vegas conference. I'm pointing to the one I wrote. I think I should start buying stock in some of these things. Ziploc bags - Yup, I have boxes and boxes! I organize all of my centers into Ziploc bags. I use the small ones for smaller pieces and then I put that bag and the rest of the center materials into the gallon size bags including recording sheets and directions. I ask parents for donations of Ziploc bags in the beginning of the year since we go through so many of them. The other thing I love about storing centers this way is they easily fit into these plastic bins and I can see right away what I have in them. 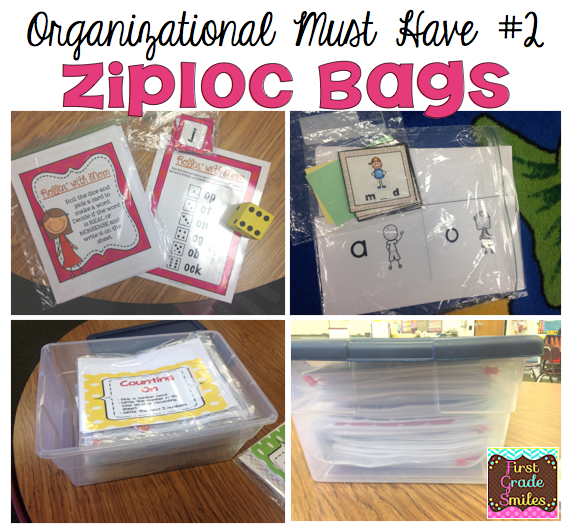 Such a time saver and helps the kids stay organized too. And speaking of plastic bins or tubs or whatever you want to call them - that's my #3 must have for today. 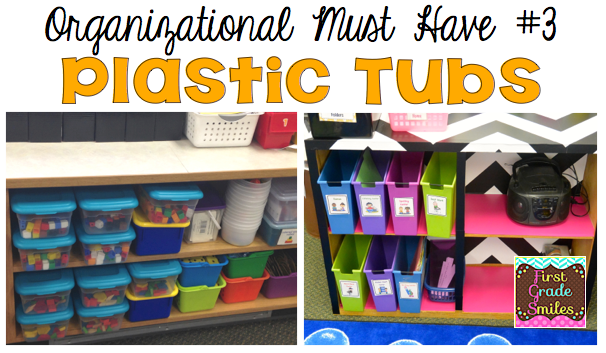 This picture doesn't even do justice to the number of plastic organizing totes I have in my classroom. Every year I buy a few more. I just wish it didn't cost so much money to be organized. But it definitely is worth it. This is a great post Melissa! I especially love the picture of you all sticky noted up! Thanks for all of the photos showing how you use these must-have supplies! I'm doing the describe a teacher adjective lesson next Monday. I can't wait for them to put sticky notes all over me. You sound just like me. I have to have post its, zip lock bags, and pretty storage. Great post! Hehe we used post it's to label things on me using possessive s! I LOVE the adjective lesson :) So fun!